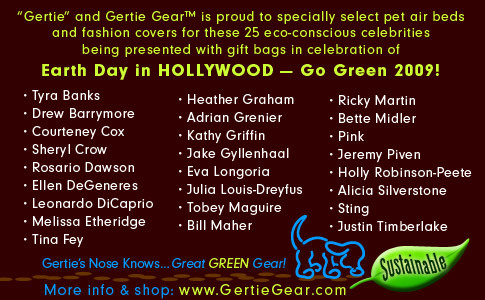 the fashionable, durable and sustainable alternative to standard pet beds as part of their “A-list” for “Earth Day in Hollywood — Go Green!” gift bags. Some of the most eco-conscious celebrities will receive the beds for their pampered pooches. “Gertie”, senior beagle, spokesdog and inspiration for the air bed design, is proud to share the style and comfort of her line of beds with the following celebrities and their pets: Drew Barrymore and Flossie, Ellen DeGeneres and her lovely pack, Jake Gyllenhaal’s Boo and Atticus, Eva Longoria and Jinxie, Bill Maher who has two rescues, Kathy Griffin’s Chance and Pom Pom, Ricky Martin’s many dogs, Jeremy Piven’s Bulldog, Alicia Silverstone and her rescues, and Sting’s Sniggers, among others. Each Gertie Gear air bed comes with an inflatable, zippered tough canvas undercover, and easy/quick-change colorful outer slipcover. Fashionable replacement slipcovers are also available in an array of fabrics and patterns to coordinate with any style/décor. SUSTAINABLE (Earth & Animal Friendly): Gertie Gear air beds hold their shape and support — they don’t compress/decompose like most other beds. They take less energy to maintain and clean — usually just wash the slipcover. Commercial quality thread, zippers and elastic make them longer lasting. Many of the fabrics used are made of cotton or other natural fibers. All covers, including the protective canvas, are machine-washable and hand-crafted in Michigan by American workers. Gertie Gear supports the efforts of Animal Rescue New Orleans (ARNO), an all-volunteer organization formed by first-responders after Katrina, in their continued commitment to homeless animals and humans in the area who cannot provide for their pets, by pledging $1 for each air bed set (and select fashion covers) sold — campaign launches on Earth Day, April 22, 2009.